Why Hair is Associated with Beauty? At RHRLI we know hair is very important to just about everyone. We work every day with people who are dealing with hair loss and thinning hair and studies have shown that loss of hair can be devastating. 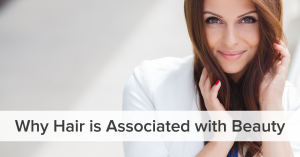 One reason for this is that hair is often associated with beauty and some studies even show a relationship between attractiveness and certain types of hairstyles. At RHRLI we’re committed to helping our patients lead a healthy lifestyle and we can help by finding you a permanent solution to thinning hair. It’s called the ARTAS® System and it uses state of the art robotic technology to conduct a minimally invasive hair transplant procedure. We also want to let our patients and potential patients know some background on how hair has become associated with beauty so you understand how integral hair is to how we think and behave. There’s a history and mythology behind hair. For example, there’s the biblical story of Samson the Israelite warrior who was renowned for his awesome strength, according to Britannica. Samson’s strength came from his uncut hair, as portrayed in the Book of Judges. But he fell in love with a woman named Delilah who beguiled him into revealing this secret and she cut his hair off. Samson was then captured by his enemies. In Greek mythology, there’s the story of Medusa, whose hair was transformed into snakes. Anyone who looked into her eyes was turned to stone. There’s also the German Fairy Tale Rapunzel about a beautiful girl with long, golden hair who’s locked in a tower by an evil witch. In more modern fiction, there’s O. Henry’s story, the Gift of the Magi, which is the tale of a poor woman who sells her long beautiful hair in order to pay for a Christmas present for her husband. All of these stories associate positive or negative characteristics with hair. Hair isn’t just powerful in stories. It also has a psychological effect on people. According to the Psychology Today, there’s some evidence that backs up the saying “blondes have more fun.” French researchers did a study in 2015, which indicated that blonde women are approached more frequently by men. That was the first of two studies the research team did. In the first study, women were given, blonde, brown, black or red wigs and the researchers noted which women were approached the most in a nightclub. In the second study, men were issued different colored wigs and were told to ask women in a club to dance. The researchers took note of whose invitations were accepted and who were rejected. Interestingly, blond men didn’t do as well as their female counterparts and didn’t receive the most acceptances. But redheads did the worst in both studies. The research was in line with similar studies, such as one that showed blonde waitresses received more tips than other waitresses. We don’t know how much hair impacts our psyche, but research shows it does, and there’s also mentions of hair and beauty in some of our oldest stories. RHRLI understands why hair has such an impact on our lives and we’re ready to help. We’re the only hair treatment center on Long Island that has the ARTAS® System. Contact us today!